I first wrote about McDonald's DVD rental program back in June of 2005. Apparently the model is starting to take off and McDonald's plans expand the number of locations offering DVD rentals via Redbox. Redbox, the nation’s leader in automated DVD rental services, and McDonald’s USA, LLC, today announced an agreement to offer fully automated DVD rental kiosks to a growing number of McDonald’s restaurants nationwide. Redbox kiosks will begin appearing in McDonald’s restaurants in select new U.S. markets early next year, offering McDonald’s customers the latest DVD titles for only $1 per night. The agreement follows a two-year test with McDonald’s. McDonald’s began testing redbox fully automated DVD rentals in 2004 in Denver. Redbox offers the latest titles, quick, self-service transactions, a $1 per night price point and a convenient rent-and-return anywhere policy. Today redbox kiosks are featured in more than 800 McDonald’s restaurants in the following six markets: Baltimore, Denver, Houston, Minneapolis, Salt Lake City and St. Louis. 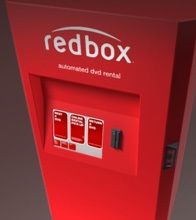 Each fully automated redbox DVD rental kiosk holds more than 500 DVDs, representing over 70 of the newest movie releases, with new titles available every Tuesday. Consumers 18 years of age or older can use a touch screen to select their favorite movies, swipe a valid credit or debit card and go. Customers can keep the DVD for as long as they’d like for $1 per night plus tax, and return their DVD to any redbox kiosk nationwide. For added convenience, customers can visit www.redbox.com to choose their favorite title online and pick it up immediately at the redbox location of their choice.